Home / Editor's Choice, Entertainment News, Forum and discussion, Gossip and Drama / If you register for Huduma number, your private data is not safe- Aljazeera expose. One of the most surreal moments of the August 2017 Supreme Court hearing on Kenya's presidential election, an event that would culminate in the unprecedented rejection of the results announced by the electoral commission, happened on its first day. Millions of Kenyan citizens' biometric data was collected over an extended period of time in preparation for the highly contested 2017 vote. However, when the data was most needed, at the point when it was necessary to verify the results announced by the electoral commission, it was unavailable. Apparently, a private foreign entity, a French firm known as OT Safran Morpho, owned the information and the government struggled to get the corporation in question to make the information available on demand. 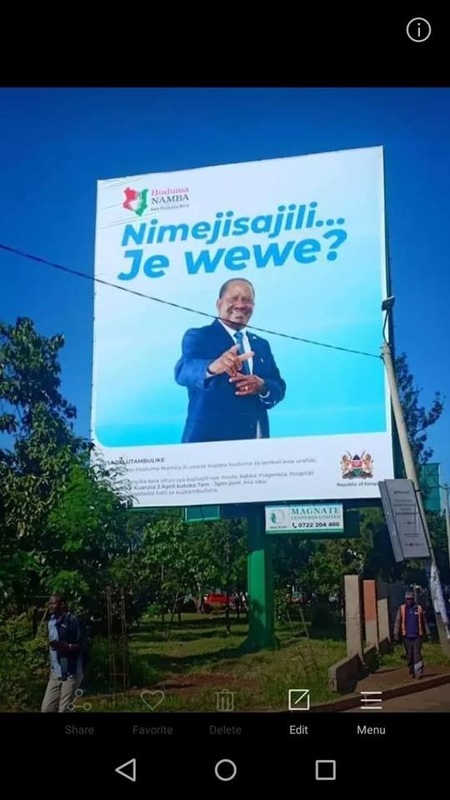 In February 2019, Kenya is gearing up to launch another massive citizen data collection drive called "the Huduma Number". Over a 30-day period, the government will compel citizens in a number of counties to register their biometric details, other identity numbers and their physical address to receive a new number to be used as "a unique identifier". The Huduma card will join your ID, passport, driver's licence, birth certificate, National Social Security Fund card, National Hospital Insurance Fund card, Kenya Revenue Authority Tax PIN, etc. For one, forcing citizens to sign up for a financial product under the threat of denying them important government services isn't governance, it is blackmail. Kenya's constitution provides that all legislation must be subjected to public participation. Therefore, it is prima facie unconstitutional for a government ministry to make a "roadside declaration": to create a new legislative hurdle for gaining an important citizenship document without allowing the public time to reflect and respond. Secondly, Kenya still does not have a data protection law. That means that this massive data collection exercise - including facial recognition, fingerprints and other key citizen data - will be in place in the absence of any real legal oversight. Remember the surrealism of Kenya's electoral servers, still owned by OT Safran Morpho, and apparently inaccessible from Kenya without interlocution by the French? There are currently no legal provisions, certainly none in the public domain, that prevent OT Morpho Safran from monetising data that Kenyans provided to enhance their democratic processes. In my book, Digital Democracy, Analogue Politics, I call this "digital colonialism" - where a private corporation in one country is given political power over citizens of a second country for its own economic benefit. The fact that Kenya's election database could not be made available on demand for what was arguably the most important legal process in the country's history is cause for major concern. Kenyan electoral data is now a product for digestion and monetisation in a legal domain beyond our control.